Descubra o melhor da beleza fenomenal da Patagônia em uma excursão de 13 dias inesquecível. 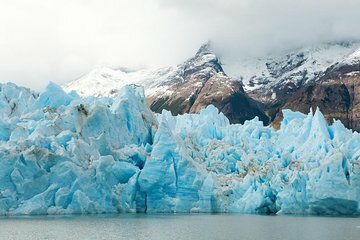 Parta de El Calafate para explorar paisagens naturais deslumbrantes na Argentina e no Chile: lugares icônicos como o Parque Nacional Los Glaciares, Torres del Paine e Terra do Fogo. Embarque em visitas guiadas com duração de um dia e escolha entre uma variedade de atividades, como escalada de geleiras e caminhadas nas montanhas. Maravilhe-se com o Glaciar Perito Moreno e suas imponentes paredes de gelo, passeie de canoa pelo Rio Lapataia e aproveite o tempo livre. O passeio termina em Ushuaia e inclui hospedagem por toda parte. Veja o melhor da Patagônia na Argentina e no Chile! The trip and all accommodations were excellent. It was truly the trip of a lifetime. The tours were wonderful and the trip was very well planned out by Viator. My only complaint would be that I would have liked more information regarding our itinerary before we left home and we had one problem with a bus trip where we did not receive any tickets in advance. Otherwise the trip was excellent. The trip was very inexpensive compared to other tour companies and we were extremely happy with all our accommodations. Here is an overall review of our trip '13 day Patagonia. This is an insider review for you to know what actually happened on the road. Also to give you the analysis of agents to put this trip in place. If you have any specific question, we are more than happy to answer! Hotel, Las Dunas, was nice, good breakfast, very helpful staff, slight problem: being outside the city, taxis were not always reliable. Los Glaciers National Park: was very good, Daniella, the guide, was very passionate about Argentina and the park, explained everything well. Kayaking la Leona river: it was nice, we were a small group, had a lot of fun. It was great that all the equipment was provided. However, description of the trip needs to be updated, it did not give enough information about the hike/walk etc. Bus: Double decker bus was very comfortable and smooth we enjoyed stopping at la Leona ranch and reading the history. Hotel Posada El Barranco: Small but ok, very helpful and friendly staff, their breakfast needs improvement, meat and cheese perhaps and some non-sweet cereal would be nice. Hikes: it was nice to decide and do the hikes on your own and discover the town as you wish. Frances Drake Hostel: No one spoke English but one person and she was never there when we needed. Torres del Paine National Park: The driver who drove the van drove fast on an uneven road without considering the effect on passengers. Nadia, the guide, did not seem to share her knowledge with the whole group. She did not point out half the information listed on the sheet given to us by Planet Patagonia. She didn't give explanations about much of the park. Seemed as if they were rushed to complete the trip and go on their own business. Planet Patagonia was sloppy and unorganized the evaluation form they gave us to evaluate the day's activities was already used by someone else. When we pointed this to Nadia, she shrugged did not even tried to find a solution. When we were out of the hotel, Planet Patagonia left a bus voucher for the next day at the hotel for us with no explanation. Any question could not be answered because no one understood enough English to help. Hike in the park would have been nice rather than driving around in a van, which was very uncomfortable Puerto Natales was nice and easy to get around to. Lacolet hotel was the nicest place we stayed except they gave us the matrimonial suite instead of two single beds. We had the best breakfast there and the staff tried everything to help us even though they didn't speak English. Planet Patagonia's ticket voucher given to us, which we realized later, was for a different bus company at a different time than what our schedule from Say Hueque said. Our schedule said 9:00am departure time, when we reach to the location at 8:35am 1/2 hour before bus leaves there was nobody. We thought we were at the wrong place so we tried the other bus company listed in our itinerary, there was a person there that helped us realize we had missed the bus. In Hotel 'Rosa de Los Vientos' room was not clean, shower was broken, adjusting heat was hard, the beds were very narrow, we slept with a fear of falling of the bed to the concrete floor . Trekking in Tierra del Fuega National Park and paddling in Lapataia river: it was a good hike, provided lunch was good, paddling in Lapataia river was fun. This was a very good excursion. Beagle Channel: it was good, Rodrigo, our guide, was very informative. Martillo Island: Fantastic! The guide Anita was very informative and pleasant. Augustina was very helpful throughout the booking process and the actual trip. She helped us the most when we missed our bus due to a time and company discrepancy on our itinerary. She even tried to set us an extra excursion while we spent an extra day hanging around in Punta Arenas which was not much fun, but it just happened to be too windy to go to. She has been prompt in responding to questions and has helped us even with situations that did not include excursions booked through Say Hueque. Overall Viator did very well, we enjoyed being met at the airport, and explained the details for El Calafate. The hotels being chosen and paid for so that we didn't have to deal with all the details but find out about the places we were interested in and do as we pleased was very helpful. One last thing, we were surprised to find out that two people from our group who paid to stay in the hostels, the lowest price, stayed half of the time at the same hotels we did. We are wondering why we had to pay more for the same services!!! Overall the trip was awesome! I'm not very athletic, so trekking is not in my future, but I still had scenic walks and a wonderful time. The Perito Moreno Glacier, Beagle Channel and penguins are not to be missed! Ushuaia has the bluest sky I've ever seen. We loved our trip. Everything was prepared perfectly. Good contact with the organisator my emails were answered almost imidiately Accomodation was like expected plus some upgrades. There was an info about our departures/excoursions waiting for us in hotels/hostels. Transport was on time. We had enough time for us and we were free to spend our time as we wanted to. I have only a good memories! Already missing sun, rain, people and landscape. My daughter and I took the 13-day best of Patagonia tour with additional activities like the kayak tour in La Leona River and Walking with the Penguins at Martillo Island. Patagonia is an amazing place and the way Viator set up the trip was excellent. On our arrival, representative from Huellas Del Sur, met us at the airport and oriented us to the town and explained what to expect. Having all the hotels and the major visiting sites arranged by Viator, gave us more time to discover the towns and hike the trails we wanted to and tried numerous good restaurants and excellent Malbec wine all along. Highly recommend to anybody who loves nature and wants to see some of the most beautiful landscape of the world! We had a pretty amazing trip. Everything was very well organized and on time and the places to see were incredible! We did not speak any Spanish but that was not a problem at all. For anyone traveling to southern Patagonia, seeing the Perito Moreno Glacier is a must! This tour was excellent with consistent accommodation throughout the trip. I had hostel private rooms and they were all fine for me and close enough to walk to the main parts of town. The only thing that was missing on the trip for me was a trip to see the penguins in Ushuaia but otherwise it was a very well designed trip and I was not disappointed! The tour I was on was booked via SAStravel. My husband and I were very disappointed in this and tour and; and did not have a very good customer service experience. Unfortunately the character limit here keeps me from providing detail, but ultimately this was not what I would call a tour and you should just arrange it yourself or join a real tour.